This weekend held many different events in some of the biggest esports, from League of Legends and Street Fighter to Call of Duty. In a small arcade tucked away in Akihabara, Japan, however, players were duking it out in some of the best bouts I’ve seen all weekend, in a language I don’t understand and a game I hadn’t heard of until this morning. Hokuto no Ken, or Fist Of The North Star, is a fighting game based on a popular anime series of the same name. Made by fighting game developer Arc System Works, best known for the “anime fighters” Guilty Gear and BlazBlue, this 2005 arcade cabinet release has something of a cult following, it seems. Going off a Google-translated blog post, this is the sixth Seikimatsu Butoukai, a three-on-three team tournament of Hokuto no Ken held at the e-Sports Square Akihabara. What makes this tournament, and Hokuto no Ken, unique? Well, where most fighting games might reward cautious mid-range play, baiting out jabs and kicks, stringing combos and managing meter, Hokuto no Ken seems steeped in incredulous mechanics. A personal favorite of mine is the instant KO, a mechanic that required a bit of digging into old game guides and blogs. The anime Fist of the North Star is about a character, Kenshiro, who can defeat his opponents by hitting certain meridian points on the body. If you’ve seen enough martial arts films, you’ve probably seen someone do it: a few jabs to certain parts of the body, and the fight’s over. Arc System Works incorporated this technique into the game using a system called Fatal KO—certain moves for each character removes a “star,” represented by the blue tiles underneath each fighter’s health bar, from their opponent. If emptied, the player without any stars can be Fatal KO’d, a super move that will instantly kill them at any amount of health. 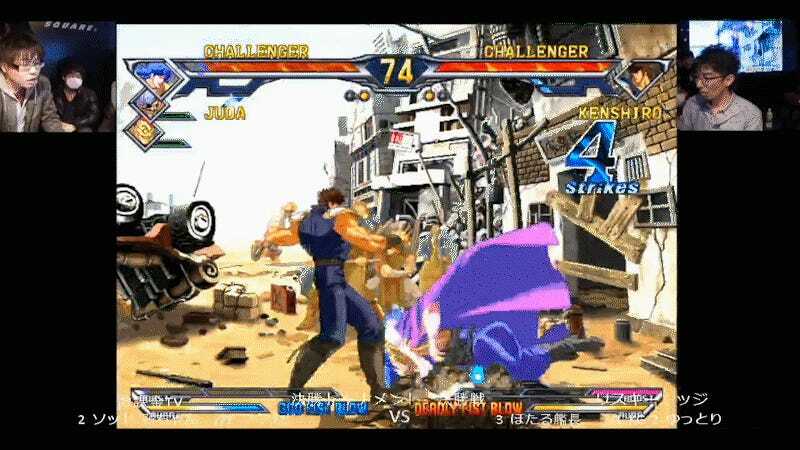 Here, you can see it in action, as a Kenshiro player uses a star-removing move in a combo, and then closes with a Fatal KO. Also, can we talk about the commentator? The scream at the end is perfect. I don’t fully understand what Hokuto no Ken is, much less know of where I could find a cabinet to play it on, and it seems like this specific tournament series only rolls around once a year. But I’ll bet a year from now, in a little corner of Akihabara, there will still be players lining up to compete in for the seventh Seikimatsu Butoukai, and this time, I’ll be sure to catch it live on Twitch the first time around.